Product prices and availability are accurate as of 2019-04-07 17:21:41 EDT and are subject to change. Any price and availability information displayed on http://www.amazon.com/ at the time of purchase will apply to the purchase of this product. 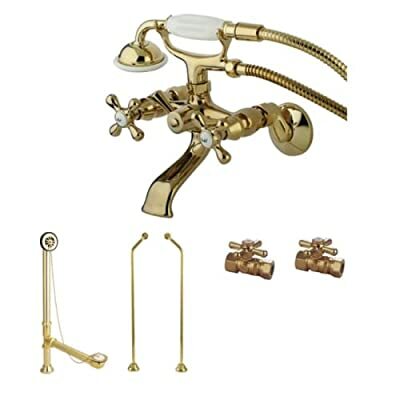 Tub and Shower Package Includes: valve trim, shower head, shower arm and tub spout Product Features: Fully covered under a 10 year limited warranty Premier finishing process - finishes will resist corrosion and tarnishing through everyday use Dual function cartridge - two handles control volume and temperature independently Designed to easily install with standard U.S. plumbing connections All hardware required for installation is included Pressure balancing valve cartridge Tub and Shower Package Includes: valve trim, shower head, shower arm and tub spout Valve Trim Specifications: Swinging temperature dial allows for pin-point water control Separate dial for volume control Complete with rough-in valve system About Kingston Brass:Kingston Brass's primary mission is to become the leading provider of cost effective, high quality products in the plumbing community. Their focus has made them grow by leaps and bounds in just a few years by identifying the key problems in manufacturing today and solving them. Kingston Brass produces high quality products ranging from kitchen, bath, and lavatory faucets to accessories such as diverters, towel bars, robe hooks, supply lines, and miscellaneous parts. With low prices, amazing stock times and quality products, you can rest assured that when you order a Kingston Brass product you will love every part of the experience, and it will last for generations to come.